Do you want to create a template with only relevant questions in it? In rules, you have another type of condition called IF. It can be challenging to know how to exactly use this condition. Check the video below for a brief explanation about IF...THEN rule. When you click on + Show only if you can add a rule to make a section visible only for certain answers to a question. In the example below we've created a rule that makes the section Pollution only visible when the answer to Year of construction is less than 1990. You can choose between a AND-rule (match all conditions) or an OR-rule (match any condition). 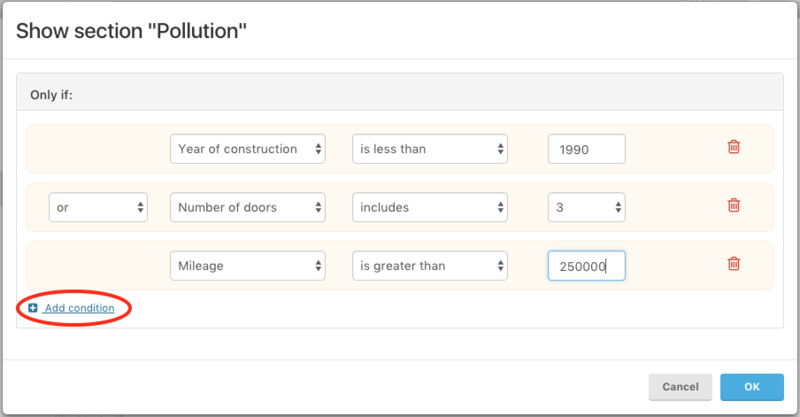 In the example below the rule means that the Pollution section is only shown when Year of construction is earlier than 1990 OR Number of doors is 3 OR Mileage is over 250.000. Your section will not show until the conditions of the rule are met.